The greenfield plant in Talegaon, Pune, will see an investment of €30 million until 2020, reports Neellohit Banerjee. 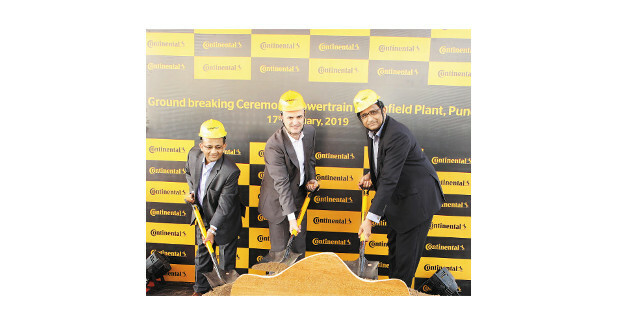 Continental witnessed the groundbreaking of its greenfield plant in Talegaon, Pune, dedicated to its powertrain business. Around €30 million (Rs 240 crore) is planned to be invested in infrastructure and buildings until 2020. The construction phase has already been initiated. Production start is scheduled for early 2020 for various drivetrain products including engine management systems, sensors and actuators as well as fuel and exhaust management components, for passenger cars, two-wheelers and commercial vehicles. In this new plant, Continental will also produce advanced sensors, advanced electronic control units, EFI systems and metallic filters. “The new products that will be produced from this plant will include knock sensors, high-temperature sesnors, EFI system for two-wheelers, fuel supply units for two-wheelers and SERs. This plant will have purely mechanical products when it comes to catalytic filters, and for EFI systems, it will be mechanical as well as electronics. They will be serving two- wheelers, passenger cars, commercial and vehicles off-highway customers,” informed Prashanth Doreswamy, Market Head, Continental India and Managing Director, Continental Automotive India. With BS VI coming up, it is required to reduce CO2 emissions and this is something that Continental wants to be prepared for. “We have received customer orders already and they gave strong commitment in order to meet the localisation requirement as well, because we know that the Indian market is cost-sensitive. Our intention is to launch products not only for passenger vehicles, but also for commercial vehicle applications, two-wheelers and off-highway applications,” Hau revealed. This investment reinforces Continental's commitment to the Indian market. “Continental has been growing ahead of the market in India. To continue doing so, we need to invest both in technologies of tomorrow, and expand our reach in the market. With this investment in our Powertrain business, Continental will better support India’s drive for cleaner air,” expressed Doreswamy. Continental has invested approximately €260 million (Rs 2,100 crore) in India during the 10-year period from 2008 for its various businesses. The company is supporting all key automotive customers in India transition to BS VI emission standards. They continue to make investments in enhancing combustion engines and electro-mobility. In 2018, Continental announced investments in India, on a high three-digit crore level until 2020. The company also recently announced an additional R&D facility in its existing automotive plant in Gurugram.